District Home Webmail Created by potrace 1.14, written by Peter Selinger 2001-2017 Pinterest Naviance Texas e! Positive Redirection Center students participate in the Autism Awareness Walk to show support for our community! PRC students come in on their time off to invest in beautifying our campus. Looks great! District Judge, Adolfo Cordova, speaks to PRC students about achieving their goals. San Benito CISD's very own Technology Department speaks to PRC students about the possibilities of pursuing a career in the technology field. PRC students are using Science,Technology, Engineering, and Math skills to plot their victory in the SBCISD Robotics Competition! PRC students are gearing up for SBCISD Robotics Competition! Raymond Martinez and Mieya Aguilar represent Positive Redirection Center at the School Board Meeting on January 22, 2019, to honor our School Board Members for School Board Appreciation Month. They are pictured with Board Secretary, M.L. Garcia. Brandon Lee Figueroa, AKA "The Heartbreaker", Super Bantamweight Boxer visits PRC. 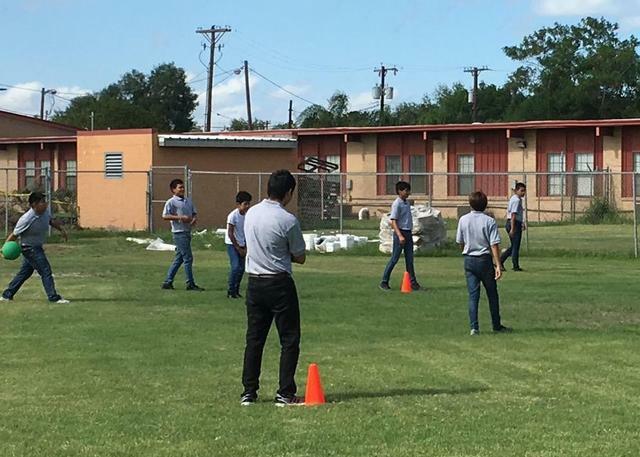 PRC students earn the privilege of playing a game of kickball, where they learn team-building skills. Click here to find out how you can help our community! Great things are happening at PRC!